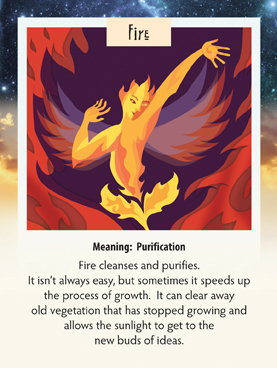 This week we have drawn the fire card. It is surprisingly appropriate and again I apologize for the timing. Last week we lost a dear friend and client Bruce Beers. He had a remarkable life and was a huge asset to our community culturally. He orchestrated the building of our beautiful performance theater, and then organized a broad spectrum of performances in that theater, from national quality dance companies to classical masters and on and on. Have a look at our current season brochure and you will see what I mean. Very high caliber art for our community of 100,000. He helped make Temecula a city with a cultural heart, rather than just a suburb with a shopping mall. The reason this card is appropriate is that his home burnt to the ground in the big fires that swept through Fallbrook a few years ago. He walked away with the cloths on his back and that is it. He could have collected more things, but had his mother with them and wanted to get her to safety. It was a huge loss but Bruce never complained about it. In fact, they built an amazing new home it its place, filled with art and beauty. They had a party when the house was just framed so we could write our best wishes on the framework. His wife commented at the time that there was a certain relief in not having to take care of all those files and files of paperwork any more. My favorite analogy is how hard it is for me to prune back a rose bush, cutting away living branches with some old leaves on them. Then in the Spring, I am rewarded with powerful new healthy growth, bursting forth and bring me an abundance of beautiful new flowers, filling the air with their beautiful scent. So look around this week to see what you can “prune” from your life. Even better if you can give it away to someone who will benefit from it. Most of us have learned over the last few years that the “stuff” of life isn’t what truly makes us happy. Treasure each day, each friend, each experience. That is what makes us truly happy. If you want your own set of cards, you can order a set from http://www.voiceofsoul.com or purchase the iPad iPhone app by searching for Voice of the Soul Message Cards. Thanks Wes…we have lost a few over the years haven’t we.